Kent County, Texas, was formed in 1876 from Bexar and Young Territories. 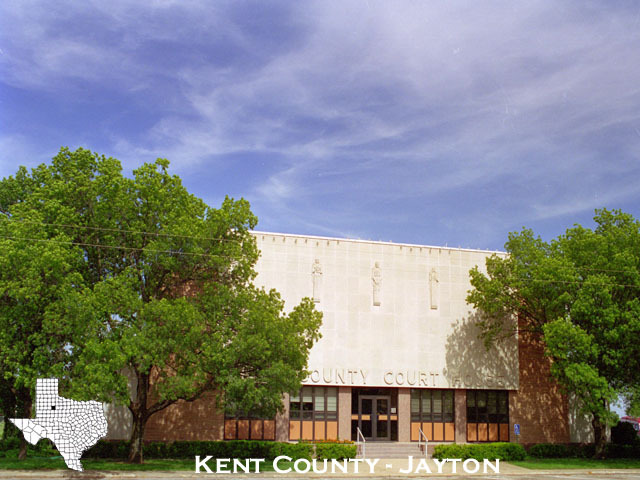 The county seat is Jayton. The county was named for Alamo defender, Andrew Kent. Hi, my name is Robin Inge, county coordinator, and I would like to welcome you to the Kent County TXGenWeb Project. I'm very glad you stopped by and hope that you find this website useful for your genealogical research. I'm always in the need of help in getting data on-line. If you'd be interested in helping, please let me know. Should you have any questions or comments regarding the Kent County Genealogy Project, please e-mail me. If you are interested in adopting one of our Orphane Counties on TXGenWeb, please contact the State Coordinator, Shirley Cullum. Please contact me if you have any Kent County information to share. National Archives and Records Administration - Great Databases!! so much to make the Kent County website what it is today.